A few weeks ago, I shared some of the photos from my Blue Cactus Press photo session. And no photo session is complete without a whole bundle of ridiculous outtakes. And when people are taking photos of me, not all the outtakes are accidental — I come from a long line of goofballs and I have a hard time taking any photo session entirely seriously. Absolutely no idea what I was doing here, but everyone loved my accidental duckface. And then I made “jazz hands” and cracked myself up. But I wasn’t done! As I wrote in my earlier post, I had explained to my wife that I wanted to look like “a guy who writes books. And isn’t always a total douche.” That sparked a conversation about what a “douchey” author photo would look like, and my wife and I started compiling a whole list of pretentious, absurd characteristics, including the “author props” we would need. And Christina Butcher, my publisher and this session’s photographer, was gracious enough to let us play. 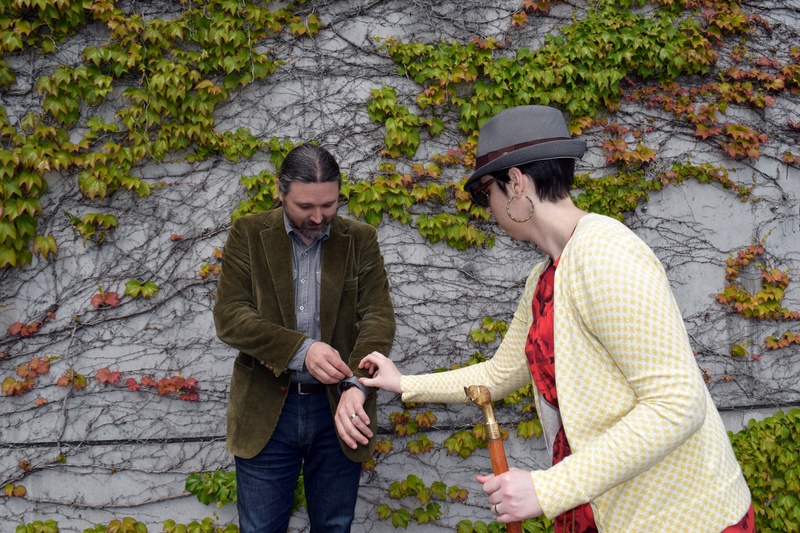 We began with my walking stick, a lovely new one I picked up in Tacoma recently. It has an intricately carved shaft and a brass elephant for the head. I bought it because the elephant reminded me of the three wooden elephants (two from Africa and one from India) that I inherited from my ship-captain grandfather. But, much as I like the walking stick, it really has no purpose in this photo session, which is why I had so much fun vamping with it and then — in true “douchey author” style, leaning it against the wall, completely useless but still deliberately in the frame. And then I got REALLY silly. Stupidly long scarf, prop cane and prop satchel, conspicuous writer’s notebook. Stupidly long scarf, prop cane and prop satchel, conspicuous writer’s notebook — plus the unworn hat is back. We also pulled the “gazing into the distance” photo, as well as a couple of “pensively reading my own notebook” poses. I wasn’t alone in goofing around, of course. Not only did my wife suggest many of these silly poses, she also (accidentally) got in on the action — she’d been wearing my hat just for a place to keep it, but when she walked over to help me with my cuffs, I stole the hat back from her, and Christina — bless her! — kept the shutter clicking!